Although the original hit version of this fine tune was by Brook Benton (who wrote it with Clyde Otis) I would think that southern soul fans would know it best for the covers by Irma Thomas and Joe Simon. 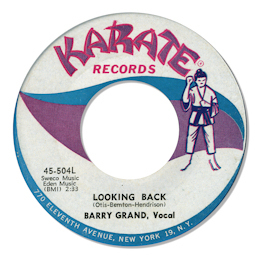 In Barry Grand’s hands Looking Back becomes a lovely big city ballad – great New York band of course and a suitably large up front vocal from the obscure Mr Grand. The pianist deserves a particular “thank you”.